On December 12, 2016, the laundry room flooded at the Hilton Anchorage. It also flooded three times in 2015. This video shows water falling from the ceiling and accumulating on the floor, while electrical equipment can be heard still in operation. This picture of the Hilton Anchorage was taken on October 19, 2016. The Hilton Anchorage has been combatting persistent mold and conditions conducive to mold growth at the hotel since at least 2014. 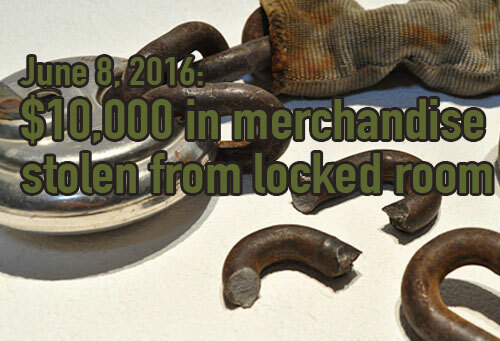 $10k of merchandise stolen from locked room! On 6/08/2016 a Columbia Sportswear representative reported to Anchorage police that $10k worth of merchandise was stolen out of a locked conference room. Read more. https://www.hiltonanchoragemoldreport.org/wp-content/uploads/hiltonanchoragemoldreport-1.png 0 0 admin https://www.hiltonanchoragemoldreport.org/wp-content/uploads/hiltonanchoragemoldreport-1.png admin2016-09-15 11:06:382017-04-12 05:51:29$10k of merchandise stolen from locked room! Rooms 824, 816, and 631 under repair for mold. July, 2016.
https://www.hiltonanchoragemoldreport.org/wp-content/uploads/hiltonanchoragemoldreport-1.png 0 0 admin https://www.hiltonanchoragemoldreport.org/wp-content/uploads/hiltonanchoragemoldreport-1.png admin2016-07-31 07:11:532017-10-25 05:38:39Rooms 824, 816, and 631 under repair for mold. July, 2016. The Hilton Anchorage has been combatting persistent mold and conditions conducive to mold growth at the hotel since 2014. 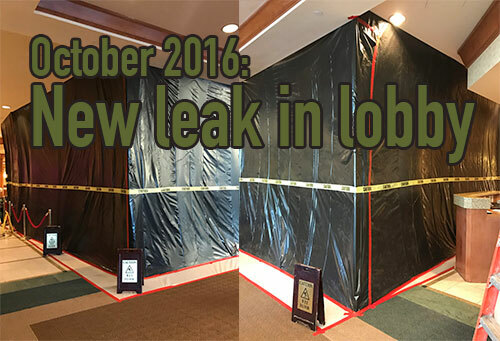 On April 1, 2016, a leak sprung from around a light fixture in the hotel’s lobby causing water to spill down onto the lobby floor, and the hotel reported repairing water damage in some rooms as a result of a January 2016 earthquake that struck the Anchorage area. The hotel also has asbestos and lead in various building material found throughout the hotel that must be taken into account whenever construction work is performed. CSC sold what had previously been the Marriott Hotel and Convention Center in Oklahoma City to its lender Wells Fargo at a sheriff’s sale in December 2015, after Wells Fargo initiated a foreclosure action against the property in Oklahoma state court in 2012. In December 2014, the court-appointed receiver reported that mold was prevalent at the hotel, and Wells Fargo amended its lawsuit in May 2015 to seek damages for alleged remediation costs. A decree of foreclosure was entered in October 2015. The CSC-owned Marriott Phoenix Airport loan was reported to have been transferred to special servicing on 9/3/15 due to what was described as “imminent default.” The loan had a 6/1/2016 maturity date and a balance of around $61 million. On 7/5/2016, it was reported that the loan was not paid off at its June maturity date and foreclosure is being pursued. In 2012 CSC lost the Richmond Marriott West in Richmond, VA. CSC had purchased the property in 2005, but by November 2012 CSC had stopped making its loan payments. The property had reportedly not been refurbished since it opened in 2001. Potential lenders will find the report useful in assessing whether to refinance the Hilton Anchorage’s debt, particularly in light of what may become a challenging financial environment for the hotel industry. UNITE HERE is a labor union that represents 270,000 working people across Canada and the United States. Its members work in the hotel, gaming, food service, manufacturing, textile, distribution, laundry, transportation, and airport industries. UNITE HERE Local 878 represents workers at the Hilton Anchorage where there is currently an active labor dispute. This report provides information on debt issues at certain Columbia Sussex Corporation properties; updates on mold, lead and asbestos identified at the Hilton Anchorage property; and information on damage caused by the January 2016 earthquake that struck the Anchorage area.